On our first night in Paignton we arrived at our luxury hotel (Travelodge) and freshened up before heading out for dinner. I had hoped we would eat at The Boathouse restaurant which has a lovely, inexpensive menu and is literally across the road from the Travelodge but unfortunately they were too busy to seat us. Onwards, then, to town! My second choice for dinner was TJ’s Bistro, the number 1 restaurant in Paignton according to Tripadvisor which offers a choice of main meals or tapas style dishes. I generally treat Tripadvisor reviews as the gospel if there are a lot on any one place – we’ve eaten at a lot of restaurants this way and have never been disappointed! So, although TJ’s didn’t look a lot from the outside (which I had also been warned of by the reviewers!) we decided to go for it. You enter the restaurant through a little door to some stairs which take you upstairs to a lovely outside verandah with lots of chairs and tables. The view from here was spectacular! There is a large, airy conservatory area behind the verandah and the indoor section holds the kitchen, bar and a waiting area with sofas and comfy chairs. There were a couple of tables in this bit that I am glad we didn’t get as it was pretty dark in there. A lovely man asked us if we were looking to stay for a meal and we said yes. He said if we waited 5 or 10 minutes he’d have a table for us as a group was just finishing. Perfect! We wandered over to the bar area and ordered drinks before realising there was no-where to sit. The man noticed this and after giving us our drinks informed us that we could sit out on the verandah and he’d come and get us. Doubly perfect. It was really lovely sitting outside in the warm air with a beautiful view of the harbour below and I was almost disappointed when the guy called us a few minutes later! Almost. We grabbed our drinks and were led to a lovely big table in the conservatory area where we started to peruse the menus. There wasn’t much on the main menu that tempted us so we decided to order a selection of Tapas dishes as we don’t often get to try Spanish food. We actually ordered rather a lot of food but, in our defence, we were starving. It was almost embarrassing telling the waitress what we would like…almost. We started with the breads and assorted dips. We love a bit of carb to start a meal so ordering this was a no brainer. We were impressed with the presentation and the actual food was delicious! There were two types of bread which we only realized when we stopped stuffing it in our respective mouths for just a second; a plain ciabatta and a strong olive flavoured crusty number. 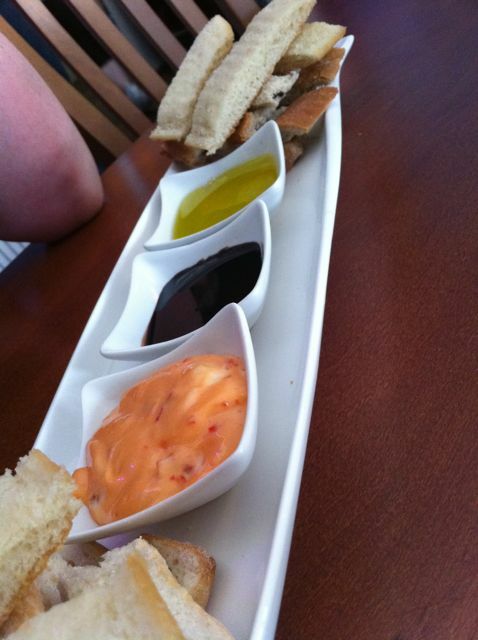 The dips were olive oil, dark, sticky balsamic and a slightly random combination of what we thought was sweet chilli dipping sauce and mayo. Nice! But probably our least favourite of the three. After we’d finished our starter, our main courses started to come out and pretty soon our table was full. I had to move the candles over and our waitress removed our excess wine glasses…embarrassing! We each ordered three dishes and shared the perennial tapas favourite, patatas bravas. For my first dish I ordered deep fried goats cheese. Deep. Fried. Goats. Cheese. How could this not be amazing? The cheese was encased within a dense, hearty batter that would have been quite at home in the fish and chip shop, none of this ‘light tempura’ nonsense thank you very much. 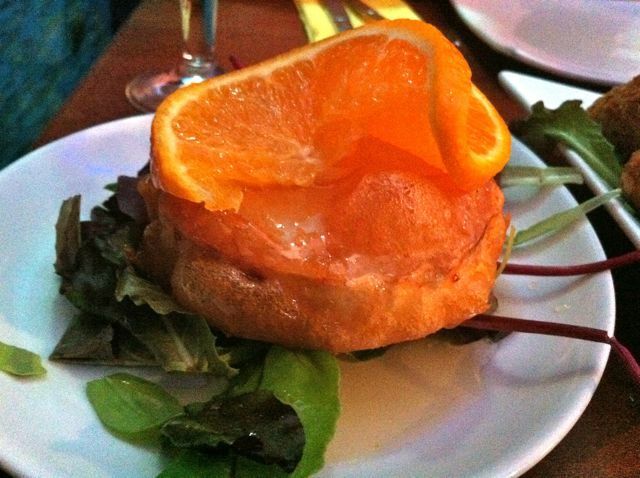 It was drizzled in honey and topped with a juicy orange slice. This was possibly the richest thing I’ve ever eaten and it ticked all the boxes – sweet, salty and tangy with a complex combination of textures – I sliced it like a pizza and nibbled on wedges in between my other courses because it didn’t really go with anything else. This was a dish with flavours unlike anything I’d experienced before though and it did work well amongst the more savoury dishes I had ordered. A palate cleanser, if you will! My second dish was one of the most expensive on the menu, oops! 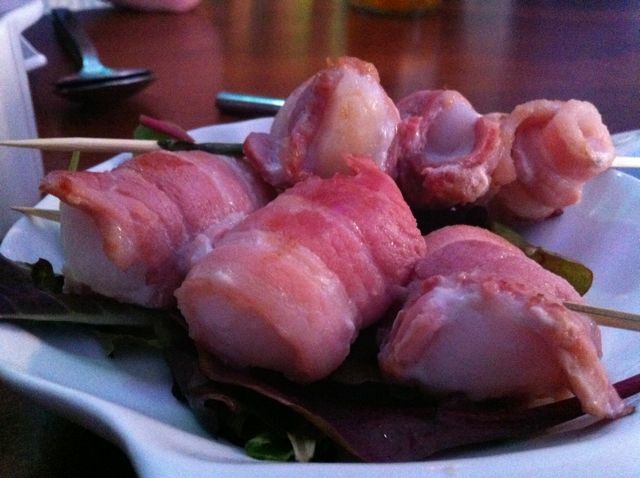 I chose the bacon wrapped scallops and my excitement levels were almost uncontrollable when they arrived. Unfortunately, as you can probably tell from the photo, they weren’t great. I was expecting a real crispy bacon wrapping but it was undercooked and flaccid. In the end I pulled it off because it was actually detracting from the scallops which were beautifully cooked. It’s not like me to turn down bacon! This was probably best though because it saved valuable tummy space for all the other delicacies on the table. 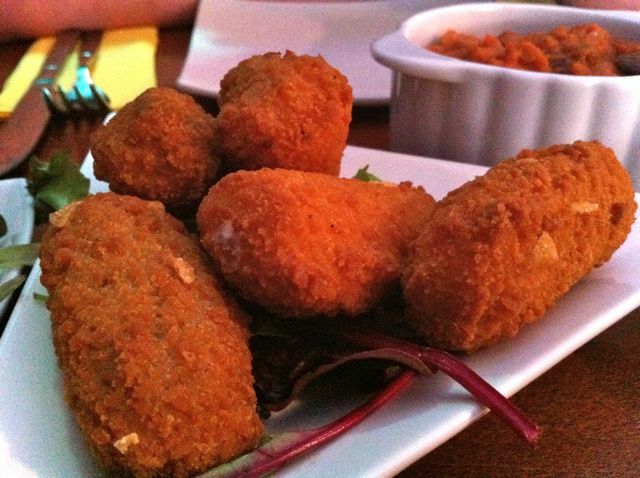 Ben ordered a few veggie dishes to enjoy with the patatas bravas – vegetable fritters, jalapeno poppers and spicy lentils. 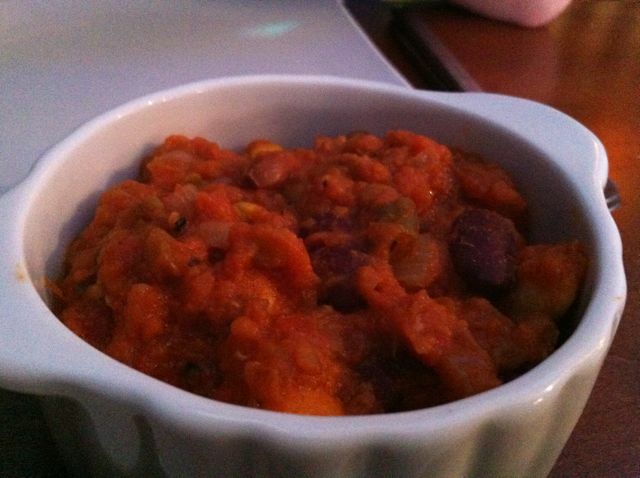 The spicy lentils looked slightly uninspiring but tasted delicious with a deep tomato flavour and strong hit of chilli. 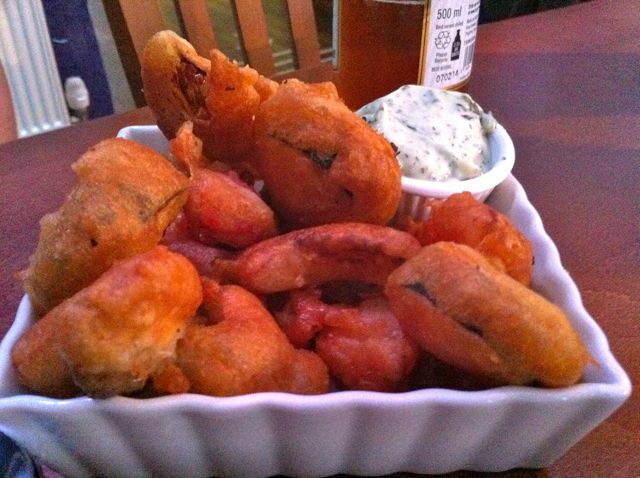 The poppers were jalapeno peppers stuffed with cream cheese and battered. You really can’t go wrong with that combination and this effort from TJ’s was lovely. I was reluctant to try them at first as I’m a chilli wuss but Ben persuaded me and I thoroughly enjoyed my sample. His favourite dish though was the ‘vegetable fritters’ which came out completeley different to how we were expecting – he was pleasantly surprised to see that they were tempura battered whole vegetables like aubergine, courgette and pepper. This was a huge portion and he was unable to finish it even with my added valiant efforts! The fritters were served with a minted mayonnaise which we were initially sceptical about but which actually went really well with the dish. 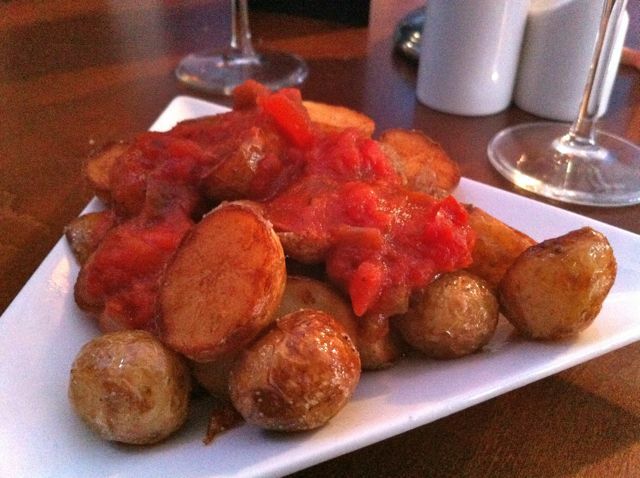 Our patatas bravas was a good sized portion with perfectly cooked potatoes and a nice, tangy tomato sauce. But, is it wrong that we missed the ‘con queso’ version that we normally have at La Tasca? You can take the kids out of a chain restaurant but you can’t take the chain restaurant out of the kids! My final dish came out a few minutes after the others. I have to say I was quite disappointed when it was served, mainly due to the size which was a far cry from the amount I would expect to receive for a dish that cost £7. 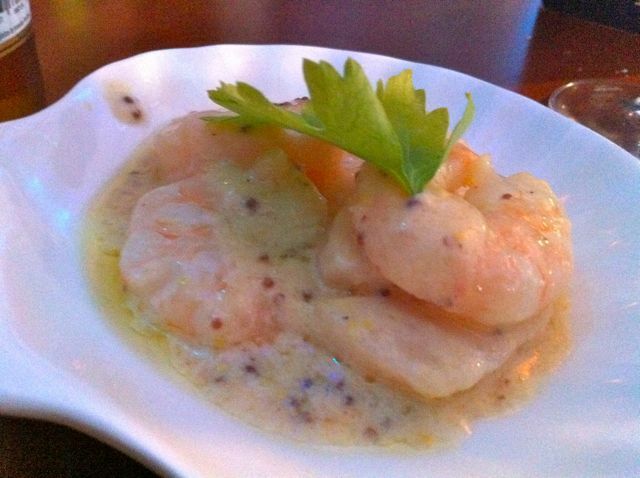 This was ‘lobster thermidor’ and it consisted of 3 king prawns and two thin medallions of lobster meat in a creamy cheese and mustard sauce. Hmmm. It was nice, but I was expecting a hot, bubbling cheese crust and a slightly larger portion size. Had I known, I would have ordered a different, cheaper king prawn dish as this was not what I expected when I chose lobster thermidor. That said, everything else was delicious and we really enjoyed our meal here. The service was lovely and the views can’t be beaten – get here early to enjoy a few drinks out on the balcony before your meal or better yet, pick a warm evening and eat al fresco! We really did feel like we could have been in a Mediterranean harbour whilst we were in TJ’s and I think the food and relaxed eating style enhanced this. Our meal came to about £60 with a couple of drinks each and it was a lovely, relaxed way to kick off our minibreak. TJ’s, we will be back!